Denver Water is beginning an $85 million major reconstruction project. Arvada neighborhoods in the vicinity of the Arvada/Blunn Reservoir will see some of this construction as it takes place over the next two years. Denver’s Ralston Reservoir, located to the west of Arvada, was constructed in 1938. This reservoir is a critical component of Denver Water’s water supply system which serves about 1.3 million people in the Front Range region. Arvada obtains about 75% of its water supplies from this reservoir. At the same time as Ralston Reservoir was being constructed, two large water pipelines were built to convey the reservoir water to Denver’s Moffat water treatment plant. These pipelines have reached the end of their life cycle and need to be replaced. In the Arvada area the work will start with a tunnel bore under Hwy 93 near 64th Avenue. Download the Denver Water Fact sheet.The pipeline will then be constructed in Denver Water’s easement through the Arvada Long Lake Recreational complex and then to the southeast. This is the first of several projects to rehabilitate and upgrade Denver Water’s Northern Collection system. Additional projects are planned for the next several years that will center on Ralston Reservoir. These projects are designed to maintain the reliable delivery of clean, safe drinking water into the future. Denver Water is committed to minimizing construction impacts, but the scope of this project is such that some disruptions will occur. 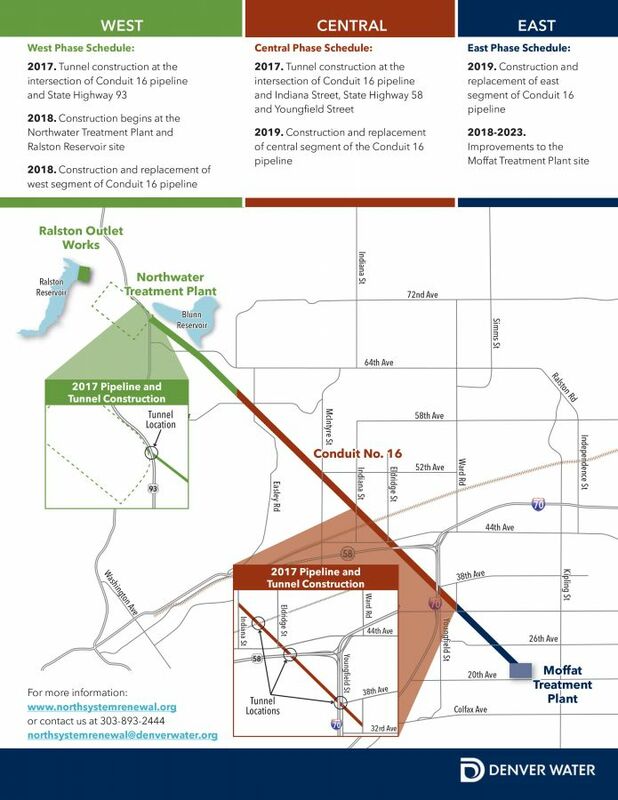 The following Arvada section of map shows the route for the pipeline replacement project. The green line represents "West Phase" construction. The red/orange line represents "Central Phase" construction. View FULL project map and timeline.